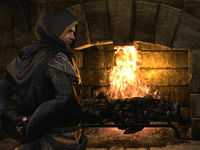 Murder a noble in his own estate to seal your place in the Dark Brotherhood. To prove myself to the Dark Brotherhood, Speaker Terenus wants me to murder the Imperial noble named Quintus Jarol. Make your way through the tunnels and kill the target. Go to the Sanctuary and speak to Matron Astara. After Speaker Terenus assigns you this task to fully prove yourself, speak to him again for some advice. He will tell you about a secret tunnel between the Withered Rose inn and the Jarol Estate. Attempting to infiltrate the estate unseen from the outside can be quite difficult otherwise. Travel to the Withered Rose which is just northwest of Anvil. Neither the proprietor Ladia Rose or her daughter Lucinia have anything useful to say, so look for the locked cellar trapdoor under the stairway inside the inn. The only item of interest in the cellar is a note from Quintus Jarol which reveals he is paying Ladia for the use of the tunnels. Four civilians are working in the tunnels and two soldiers are patrolling. This a good opportunity to practice with the Blade of Woe, as all of them will at some point turn their back on you. It is also possible to sneak unseen past all but one of the soldiers/civilians if you prefer to keep casualties to a minimum. Outside the tunnel, it is a fairly simple matter to make your way west to the main building, which is also locked. Avoid or eliminate the single guard in the cellar and proceed into the tunnels. Inside avoid the two siderooms and make your way upstairs. Watch out for a tripwire at the top of the stairs too. Look for the letter from the governor on the table, which talks of a secret chamber underneath the estate, and gives clues to its entrance. When you came upstairs two soldiers entered the building, and they now patrol downstairs. Watch their patrol pattern and make your way to the wine cellar entrance. In the cellar pick up the contractor's note which reveals exactly how to unlock the entrance and where it is. There is a tripwire at the top of the second flight of stairs. Watch for a guard patrolling this long stretch of tunnel. At the other end you will be able to overhear a secret meeting between Quintus, Governor Fortunata ap Dugal of Anvil, and Count Carolus Aquilarios of Kvatch. Listen to it then deal with or sneak past the guard who is also listening in. Head to the northern tunnel, but watch for a guard who patrols right to the entrance and a tripwire. Follow the path up to another locked gate. There is another guard patrolling this room, then head south to eavesdrop on more of the meeting. At this point a guard will interrupt the meeting and announce that some guards have been found dead and they suspect the Brotherhood has arrived. Head east into another tunnel. Watch for the tripwire and sneak behind the planks leaning against the southern wall to stay out of sight of the next guard. Alternatively, there is a hiding spot in the room to the north. The next section from here is heavily populated with guards, so it is best to eliminate them to give time to assess your approach to the next guard. Turning south, pass by the room to the east, and watch for a guard walking the east-west tunnel. The eastern room has two guards and you will get a bounty if you take them on. Another guard patrols the north-south tunnel, and there is another eastern room, this time with three guards. Avoid it if you don't want a bounty and make your way around to the main room. Commander Pelletus patrols this room, and conveniently also the part of the tunnel past the hiding spot. Though you can line him up to kill him with the Blade of Woe, you won't receive a bounty if he or any of the guards in the next section see you. Go through the meeting room and into the western tunnels. Watch out for a large wire trap at the corner with a mage nearby. At the bottom of the tunnel are two guards. Wait for them to split up and then deal with them. There is a hiding spot in the next room and another guard. The hiding spot marks the end of the bounty-free guards. Directly north of the hiding spot is a secret tunnel which avoids the long path containing multiple guards, wardens, and traps. If you choose to go the long way around it is quite awkward to avoid the wardens detection radius, but not impossible. 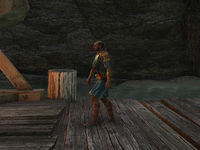 Let the warden climb the boardwalk to the left and then stay to the right, but not for too long as the boardwalk to the right has three guards, one of whom will walk down and into the tunnel you aim to traverse. There is a hiding spot on that boardwalk but it is too close to the guards to be useful. Instead, go to the shadows to the left and wait for the guard to return back from the tunnel, then press ahead. There is a guard around the next corner and another two in the alcove to the north. Deal with the patrolling guard quickly before one from the opposite side of the tunnel gets within range, then dive into the hiding spot to the north, behind the pillar. Continue on and where the path turns north is where the secret tunnel cuts to. Around the final corner is a subterranean dock. Two wardens patrol the docks along with Quintus, who is expecting you. He taunts you to attack him directly rather than from the shadows, but doing so will make you lose your bonus. Both wardens will wander over to the near side, so take your time and eliminate them first. Then make your way along the north of the dock behind the low fence which hides your approach. Wait for Quintus to walk past your position then strike. Leave the estate through the dock exit and return to Speaker Terenus. He will give you the password to the Black Door and tell you to go to the Dark Brotherhood Sanctuary and report to Matron Astara. If you have obtained a bounty and wish to clear it, there is no way to do so from within the Brotherhood, you must visit an Outlaws Refuge and speak to a fence. To get close to the Imperial noble, I need to find a way to get inside his estate. It's located northwest of Anvil, along the Gold Road. I'm inside the home of the Imperial noble, Quintus Jarol. Now I need to find him or uncover clues as to his current location. I made it inside the Jarol Estate. Now I need to locate my quarry, the noble Quintus Jarol. 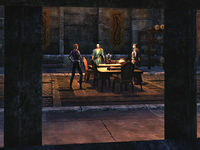 Quintus Jarol has just finished a meeting with the Provincial Governor of Anvil and the Count of Kvatch. Now that the meeting has broken up, I should finish my mission and kill the noble. Quintus Jarol is dead. Now I need to find a way out of his estate. I should return to Speaker Terenus at the Anvil Lighthouse and tell him that the noble he wanted me to kill is dead. I need to find the Black Door and gain entry to the Gold Coast Sanctuary of the Dark Brotherhood. Finishes quest I gained entry to the Dark Brotherhood Sanctuary. Now I should find Astara and talk to her about what they expect of me. This page was last modified on 6 December 2017, at 16:15.